Learn how one man reluctantly took on the most powerful institution of his day and won. 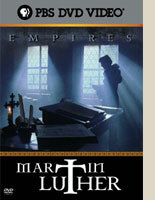 Martin Luther is credited with expounding a new vision of man's relationship with authority. Filmed across Europe - from rustic rural Germany to the opulence of Vatican City - you'll witness the collapse of the medieval world and the birth of the modern age. You can own this special series on DVD and video. The DVD includes bonus material such as extra interviews and a behind the scenes special.